We have worked hard all year to help get Democrats elected, and have much to celebrate! Join us to lift a glass in honor of all of our wonderful 2018 candidates, reconnect with friends old and new, and share in our hope of an even brighter future for North Carolina. 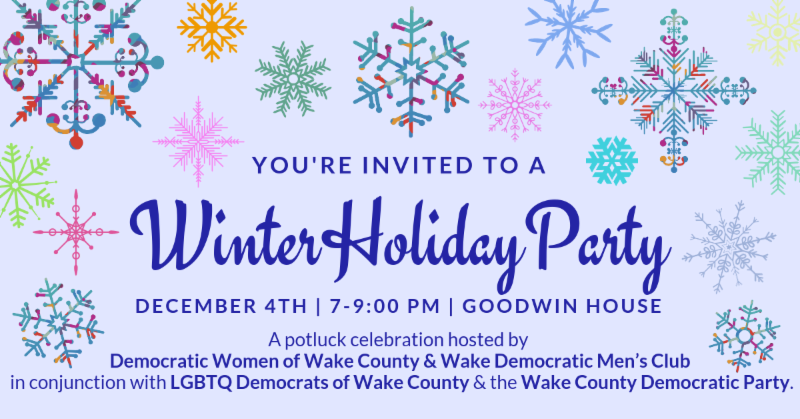 Join us Tuesday, December 4th, 7-9 p.m., at the NCDP headquarters, historic landmark Goodwin House, 220 Hillsborough Street, Raleigh, NC. We look forward to seeing you soon for a festive evening! This will be a potluck. Democratic Women, please bring your favorite holiday dessert or sweet treat to share. Dem Men's Club and LGBTQ Dems members should contact their leadership about what is needed to bring. If you’re not in any of these groups, please bring an appetizer.